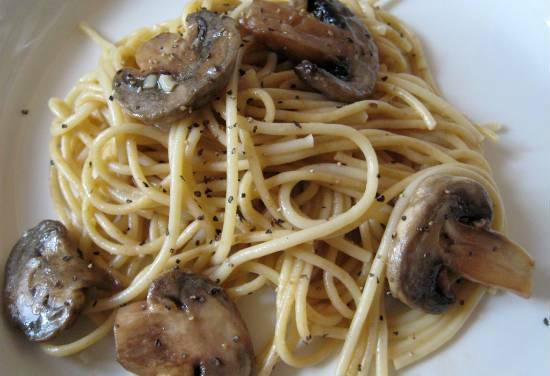 This easy to make pasta with mushrooms and garlic is ideal for a quick lunch or dinner. 1. Cook the pasta as per packet instructions and keep aside. 3. Add the mushrooms and a pinch of salt. 4. Cook for 10 minutes or until the mushrooms are browned. 6. To the same pan, add the garlic and cook for 2 minutes. 7. Add the mushrooms and cream. Stir well. 8. Sprinkle some salt and pepper. 9. Add the pasta and cook for a minute or two. 10. Garnish with the cheese and remove from flame. Tip: If you want the pasta to be creamy, add some more cream. Feel free to comment or share your thoughts on this Garlic and Mushroom Pasta Recipe from Awesome Cuisine.